Scumble by Ingrid Law. Grades 4-8. Dial Books for Young Readers, August 2010. Reviewed from ARC provided by publisher. 401 pages. Things start to come apart for Ledger Kale on his thirteenth birthday. Literally. In Ledger's family, kids get a savvy, a special power, on their thirteenth birthday. Ledger had been hoping for super speed, but savvies don't work that way. They're unpredictable. And Ledger's savvy seems to be the power to destroy man-made objects. After he demolishes his uncle's barn at his cousin's wedding, Ledger's parents decide it'll be best for him to spend the summer at his uncle's ranch in Wyoming learning to scumble his savvy. But Ledger's afraid he'll never be able to control his new power. To make matters worse, Sarah Jane, a girl from the nearby town of Sundance, keeps following him everywhere, determined to uncover the secret of his strange family. What will happen if the world finds out about their savvies? 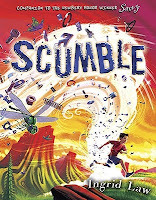 I really enjoyed the Newbery-honor-winning Savvy, but I think I liked Scumble even more! It's got the same rich tapestry of description and language that Ms. Law employed in writing Savvy. While Savvy is about a girl anticipating her power and wishing and hoping for it, Scumble is about what happens afterward - the struggle to grow into this newfound ability. It's about learning to take the world into account, moving from your self-centered childhood into a more worldly young-adulthood. And I literally stopped and thought "That's so clever of a thirteen-year-old kid to say that! It's exactly what grown-ups are like!" And then I had to stop again and say to myself "No, Ledger Kale did not write this book. He's fictional. Ingrid Law made up that line and she's a grown-up!" Which, to me, says that Ledger became much more than a character to me. He became a literary friend. Here's hoping that Scumble's not the last we see of these magnificent families. If it was up to me, I'd want to know Gypsy's story next. Just sayin'. Scumble will be on shelves August 24! And I already know a couple of kids that'll be itching to get their hands on it. I really enjoyed Savvy, so I'm totally looking forward to this one now! Cool! I just added it to my "stuff to put on hold" list. Read Savvy a while back. Challenge is going well for me. I wish I had 2 or 3 more hours under my belt, but that's okay. I'm trying to finish another book and then do another blog post before listening to more of my audiobook. Savvy didn't quite do it for me...not quite sure why. I shall hope for the best with Scrumble! I hope your reading is going well! I loved this book too!!!! I would also really like to read Gypsy's story. I am so impressed with your 48hbc results! Keep up the good work!